Have you ever entered somebody’s home in the summer with the hot afternoon sun streaming into their bright yellow living room and felt like you’re drowning in a container of lemon curd? Perhaps a bit too much sunshine! The message? Light matters. When you’re choosing a paint color for a room in your home, pay attention to which direction the light is coming from, how big the windows are, what the function or desired feel of the room is, and the shade or tone of the color you’ve selected. Here are some things to think about — not rules — just guidelines. Function: Gathering, conversation, reading, and TV. Direction of light coming in: Important as the living room is often the first room you see when you enter your home and where you receive guests, day and night. Function: Primarily sleeping. Exception: Kids’ rooms. Since kids often play in their rooms, you can ramp up the palette to please them (a topic for another post!). Direction of light coming in: Not a huge factor since you’re in there primarily at night anyway. 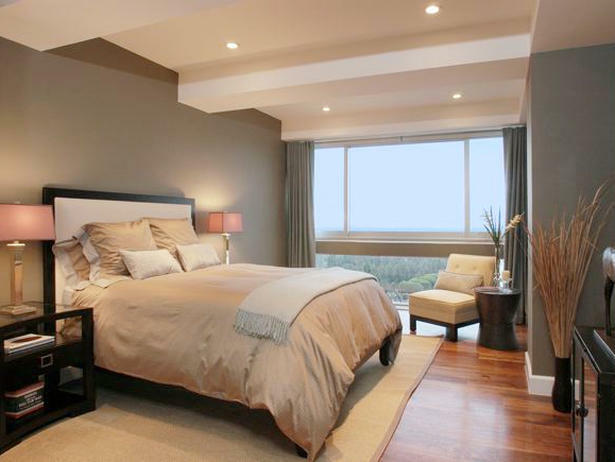 Desired feel for the room: Spacious if the room has little square footage and relaxing for a good night’s sleep. Color choice: You can go in one of several directions. For the spa feel, look at light grays, gray-beiges, and calm gray-blues/greens. For a cheerful awakening every day, include pops of color like orange, yellow or shell pink like in this bedroom by Nicole Sassaman Designs (http://www.nicolesassaman.com). Luxurious with cream bedding! Desired feel for the room: Stimulating and dramatic. Function: Cooking, eating, entertaining, and sometimes studying. Direction of light coming in: Vital since you’re in the kitchen at all times of the day and night! Desired feel for the room: Warm and welcoming. Color choice: Okay, now this is where it gets tricky. Start with your cabinets. Are they dark? What color is the counter top? You’ll want to introduce some contrast in the room either by choosing a lighter tone for the walls or bringing in a complementary color. Are your cabinets light? 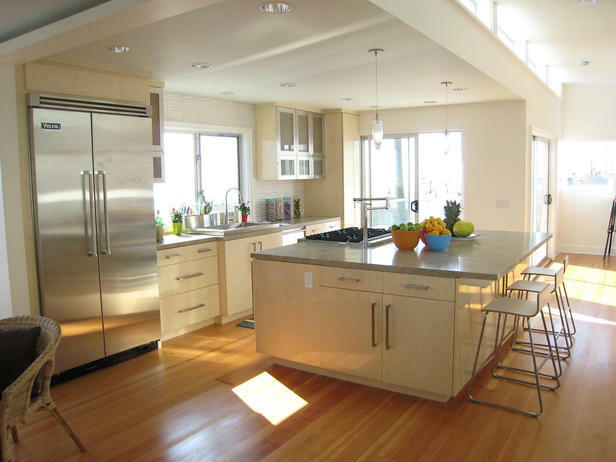 As long as there is some contrast somewhere in the kitchen, you can choose a light wall color for a light and airy feel to the kitchen like this one by designer Lori Dennis (www.loridennis.com). Lori uses the warmth of the wood floor and different tones of whites and warm grays to warm up this light, open kitchen and adds pops of color on the counters as well. If you have a separate area for watching movies on the big-screen TV, then go medium to dark with the walls and even the ceiling. The idea is to recreate that movie theater feel and eliminate glare at the same time. 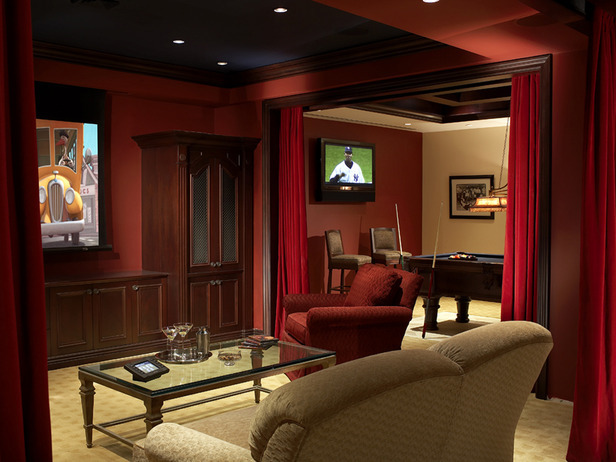 Gray, navy, eggplant, chocolate and rich red — all great wall colors for the “man cave” like this one by designer Phyllis Harbinger (http://www.dcistudio.com). « What’s All the Buzz about Undertones? 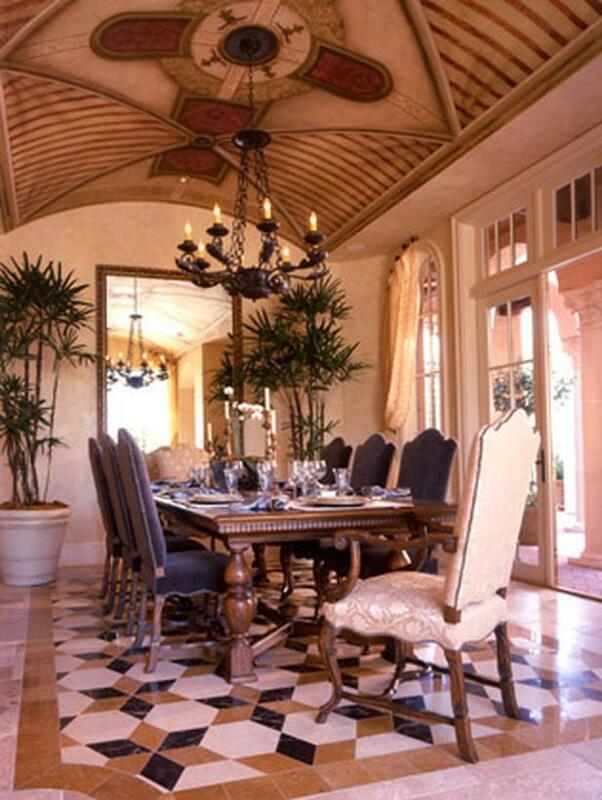 You are currently reading Choosing a Wall Color: Light and Lighting Help at Your Home & Color Coach.